FHA MIP Rate and Duration Changes starting April 1, 2013 and June 3, 2013. The following changes to FHA Mortgage Insurance Premiums (MIP) will take effect with the respective case number assignment dates, April 1st, 2013 and June 3rd, 2013. These changes are big and may affect borrowers affordability and/or ability to qualify for FHA financing. NOTE: These changes only affect FHA Loans with case numbers assigned after April 1st, 2013 and has nothing to do with the Sales closing date. Therefore, If you have a FHA case number assigned on March 31st, but the sale is closed sometimes in May or after, these changes will not affect your purchase. Effective with FHA case numbers assigned on or after April 1, 2013 FHA Mortgage Insurance Premiums will increase. of the base loan amount. Reverse mortgages are increasing in popularity with seniors who have equity in their homes and want to supplement their income. The only reverse mortgage insured by the U.S. Federal Government is called a Home Equity Conversion Mortgage or HECM, and is only available through an FHA approved lender. FHA’s mortgage insurance provides opportunities to low- and moderate-income Native Hawaiians to purchase a home on Hawaiian home lands. FHA insures loans made to native Hawaiians to purchase one- to four-family dwellings located on Hawaiian home lands. A family who purchases a home under this program can apply for financing through a FHA approved lending institution such as a bank, savings and loan, or a mortgage company. To quality, the borrower must meet standard FHA credit qualifications. An eligible borrower can receive approximately 97% financing . An eligible party can produce a gift for the down payment. Closing cost can be financed; covered by a gift, grant, or secondary financing; or paid by the seller without reduction in value. Effective with FHA case numbers assigned on or after June 3, 2013 FHA Mortgage Insurance Duration will change. HUD “Title I” insures private lenders against loss on property improvement loans they make. HUD does not lend money for property improvements. Title I can be used in connection with a 203k Rehabilitation Mortgage. To better understand the impact of these changes on a borrower, let’s use an example with following assumptions. Let’s assume a borrower is purchasing a house for $200,000 with 3.5% down (LTV=97.5%), and getting a 30-year fixed FHA loan at 4%. 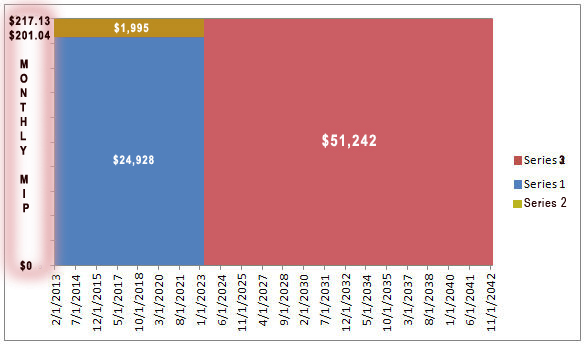 Using a Mortgage Amortization Table or Calculator, we find out this happens after paying Monthly Mortgage Payment (Principal + Interest) for 124 Months (10 Years and 4 Months). In the above example, This is an increase of $16.09 = $217.125 – $201.04 MIP per month. The borrower will be paying this Monthly MIP for the entire loan term which is 30 years or 360 Monthly Payments. This is an increase of $53,236.04 = $78,165.00 -$24,928.96 total MIP for the entire loan term. A summary of these results are shown in Figure 1. Assumption: purchasing a house at $200,000 with 3.5% down (LTV=97.5%), and getting a 30-year fixed FHA loan at 4%.Interest Rate. For more information about these changes and changes related to the Base Loan Amount > $625,500, please visit HUD website at Mortgagee Letter 2013-04.